Alert the Harvard Business School alumni association: The Ancient and Honorable Artillery Company holds its annual leadership change tomorrow, and that means a march around downtown with frequent firing of muskets, with even more musket fire - and cannon fire - on the Common between 1 and 2 p.m. Read more. Annual ka-booming on the Common (photo from 2016). A California man who claims he suffered permanent ear damage from one of the Ancient and Honorable Artillery Company's annual June artillery barrages on the Common wants $20 million in recompense - half from the historic group and half from the National Guard. Read more. 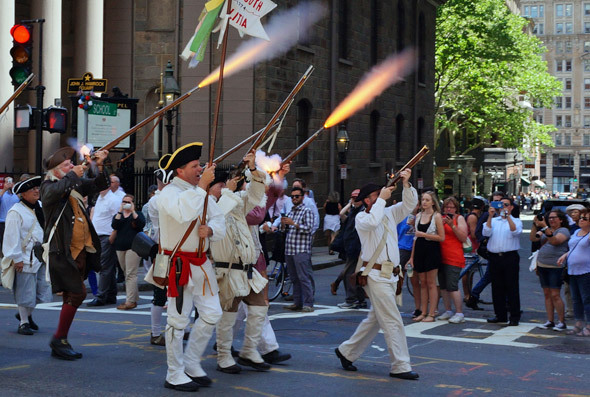 Ted Folkman watched the musketfire downtown as the Ancient and Honorable Artillery Company held its annual June procession. It's just our Ancient and Honorable Artillery Company doing their annual procession. Like this. Oh, and they might shoot off a cannon or two. Huzzah! Any lobsterbacks on Tremont trembled in fear this day. The Ancient and Honorable Artillery Company held its annual march around downtown as part of its ancient and honorable election of new officers on the first Monday in June. In addition to Minutemen and current service members, actual members of the artillery company marched, of course: Read more. There's a logical reason the Ancient and Honorable Artillery Company was flying a Confederate flag today, right? Somebody carries a confederate battle flag every year in the parade. Anybody know why? It's part of the annual first-Monday-in-June change of command for the Ancient and Honorable Artillery Company. Cannon on the Common. Copyright Stevilboston. On the first Monday of every June, the Ancient and Honorable Artillery Company elects a new leader, then marches from the Old State House to lay a wreath at the grave of their first captain, Robery Keayne. And that's what there were a bunch of guys in uniforms marching around downtown today.